imuno® is a new formula, based on past experiences and scientific principles, that represents a quantum leap when compared to previous formulas. imuno® contains a patented component that is almost twice as effective as, and much purer than the functionally comparable component of similar formulas. imuno® is revolutionary. It does not contain any product of animal or human origin, at variance with similar formulas. imuno® is designed by Molecular Biologist, Dr. Marco Ruggiero, MD. Ph.D. Author of peer-reviewed scientific papers on immunotherapy and quantum biology. imuno® for superior immune support was conceived in 2018 by the same Dr Marco Ruggiero. imuno® is the elegant solution. It is the revolutionary supra-molecular structure that reproduces the self-assembly of cell components. This delivers the combined molecules, at the same time, at the required dose, to their biologic targets, and produces powerful support. Also, the manufacturing process for imuno® is meticulous and time-consuming, and it is not technically possible to get the same result by simply mixing the ingredients together since the procedure follows a proprietary algorithm based on biologic negentropy. Store: refrigerated or cool and dark. Once opened: store refrigerated (< 8 °C) and closed. If the oral adapter used (membrane wide open) then use contents within 60 days. If a sterile needled syringe is used (membrane intact, contents sterile) then use contents within 24 weeks. Chondroitin Sulfate has a blood thinning effect similar to heparin, so when taking larger doses, people on anticoagulant drugs, are advised to be under medical supervision. imuno™ is pH neutral and sterile due to the requirement to microsize the formulation. Being pH neutral and sterile also means imuno™ is safe to use in all the ways that your doctor may prescribe. Please ask your doctor for advice. Each Vial Contains: 3 ml, which equals 15 x 0.2 ml servings (maximum dose 0.5 ml daily). In General: Start slow with 0.05ml (1 drop) every 3 days and titrate up as tolerated. imuno® is a sterile, slightly thick and cloudy liquid of indistinct taste and may be used as an oral dietary supplement. Squirt required dose into mouth. Hold in mouth for 30 to 60 seconds and then swallow. Rub imuno® gently into facial wrinkles. Note: 1 x vial adapter and 1 x 1 ml needleless syringe supplied as standard. Note: every division on the supplied 1ml needleless syringe equals 0.02ml, with major divisions numbered at each 0.1ml. Prise the plastic flip-top disk from the top of the vial. Remove the vial adapter from the packaging and push it onto the top of the vial. The plastic spike will pierce the grey stopper visible in the centre of the metal top, and the adapter will clip into place. Invert the vial with syringe underneath and draw the syringe open to the required amount (i.e. 0.2 ml). Turn the vial upright and remove the syringe from the vial adapter. The valve will close and seal the vial/adapter on syringe removal. Use the required dose from the syringe. 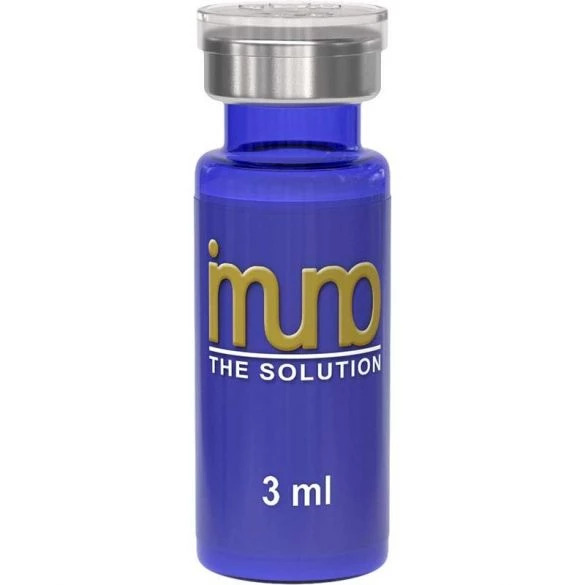 Optional Empty Spray Bottle for imuno® (Delivers approximately 0.1ml spray volume per pump) - Request this by noting it on your order under "Leave a message. If you would like to add a comment about your order, please write it in the field below". This comment field is just above the tick box "I agree to the terms of service"
*Disclaimer: None of our products are intended to diagnose, treat, cure, or prevent any disease. Our products are chosen for their ability to support the body’s healthy immune system, and larger doses of supporting products may be required in times of stress. Just like more food is required, when more exercise is undertaken. If you are under more stress, then please take up to the recommended maximum dose or the dose as prescribed by your doctor. For my 7-year-old boy with ASD after 8 weeks with immo 3ml subcutaneous injection + Colostrum-MAF + Bravo Probiotic Suppositories + Hymalaia (Varuna & Jatamansi) Tea + ALA & ChemMetalDetox Forte + Probiotic life has changed and is much better . It socializes, is careful, slashes, makes good lessons with the teacher, sleeps well, eats new things (fruits). Line right to recovery. imuno 3 ml injectable and subcutaneous is very precise, very effective and is a great winner in the fight against ASD. Thank God, you are wonderful and incredible, Dr. Ruggiero, thank you for your help with ASD. Friend for life, i recommend! My scan shows imuno has reduced the size of my tumors. Amazing product thank you. First few weeks we experienced die off symptoms, passing of worms and possibly eggs, laughing hysterically for not real reason this subsided after a few weeks. We have experienced no negatives effects. We are now at week 10 and each week we notice more improved conscious awareness, increased eye contact and social interaction. Sleeping better, more calm and engaging. He has gone from mostly mute to full on fluid babbling has said several words and combined words but not consistent. We combine Imuno with Bravo suppositories, My Amino, Sophia Flow Cream and PB125 from pathwaysbio.com. We notice most dramatic improvements approx 24 hrs after administering that taper off slightly by the end of the week. We wish you success with your healing and would recommend this product. Tony A. on 25/Sep/2018 working for me. kidnay tumor shrinkin. very happy. Debbie H. on 15/Sep/2018 This is working, very expensive for us, but we look forward to complete recovery. Tony A. on 25/Aug/2018 Really happy to have started immuno. Its only been a week and I'm breathing much easier after each session inhaling it. Hope this is a sign my lung cancer is shrinking. I have seen a 30% decrease in overall pain despite using the same amount of painkillers. If this keeps up I may possibly be able to stop using the painkillers within some weeks. I have been fasting on and off for weeks now due to the lack of appetite from painkillers. I'm pretty sure that's similar to ketosis if you eat nothing for like 60 hours. I occasionally break the fast with a small piece of fruit or a tablespoon of honey and cinnamon in my green tea. I really do want to transition into a normal ketogenic diet, but I need to be completely off my painkillers first. It's nice that I can already see some small results after only 3 doses though. 30% overall reduced pain is no mean feat. Starting Immuno after several rounds of Rerum with results that amazed doctor. Stage 4 prostate c with no metastization, and "undectable" antigen levels at 3 month psa test after surgery. I find it necessary to take before bed as it has powerful relaxation affect. Debbie H. on 16/Aug/2018 We are looking forward to our order arriving here. We are on the first shipment outgoing, and will report back on the results achieved. We are very excited, and will order more when the healing results start showing signs of improving the condition. Also, Dr Ruggiero's interviews and lectures are very educational and inspiring. He is a brave and outstanding doctor, we wish he would train many more doctors to teach his methods. Imuno is a novel type of immune supporting compound that targets the innate immune system. At variance with other immune stimulating molecules that target only one type of cells (e.g. macrophages), Imuno targets all cells of the innate immune system and, because of this, helps to direct the adaptive immune system against cancer cells, cells infected by viruses, cells harboring abnormal proteins or pathogens. imuno™ offers Superior Immune Support. The vegan source low-molecular-weight chondroitin sulfate in imuno™ is a major upgrade with almost twice the clinical efficacy over Rerum and its animal derived chondroitin sulfate. Also the pure phosphatidylcholine being the major constituent of cell membranes and the usual constituent in human blood that is assembled with glycosaminoglycans is more effective than the oleic acid (olive oil) used in Rerum. Finally the dose of vitamin D3 in imuno™ is double the dose found in Rerum. imuno™ is a multi-molecular complex based on vegan low-molecular-weight chondroitin sulfate, phosphatidylcholine and vitamin D3. These molecules, which are endowed with known healthy properties, are arranged in such a way as to reproduce archetypical protocells able to send putatively restorative radio signals to DNA. Due to its peculiar molecular design, the function of imuno™ in the context of immunotherapy shows a dual nature. On one side, the known health effects of its components are amplified by their assembly in a multi-molecular structure held together by a higher number of non-covalent bonds produced by a proprietary biologic negentropy algorithm. On the other side, the physical-chemical features of the emulsion enable imuno™ to function in a manner superimposable to that of Freund’s adjuvants. Journal of Integrative Cancer Science and Therapeutics (27 Sep 2018). The Madridge Journal of Vaccines (29 Sep 2018).